Sherrie ~ oh my this is just ADORABLE!! Okay LVOE the sentiment on that banner, the frame/base and oh my the face!! I LOVE she is winking at us!! Seriously too CUUUTE!! Yay ~ crafty time with friends!! Wish I had that ~ Hope the weather is treating you all okay up there?? Darling bear angel- love the glimmer and shimmer and that tiny bow. And, that die cut is a gorgeous edging! 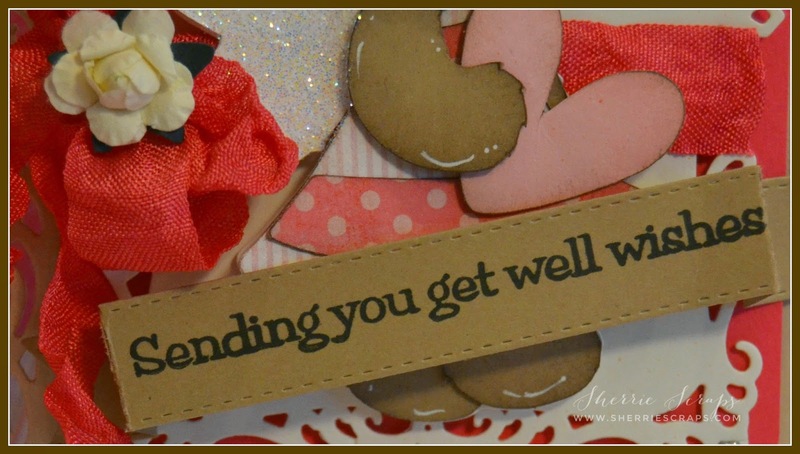 Love your bow too : ) This will surely make the recipient feel better! I love the way you designed the card with lacy edges. The teddy is so cute. This thoughtful card will surely bring a huge smile to the recipients face. OMG! I think I feel in love with this cutie patootie!! She is just Precious!! Love the gorgeous bow & color combo.I love tat KBD teddy bear as well. Oh Sherrie, she is so sweet!! I love her adorable winky face!! She's so precious!! Her sparkly wings are beautiful!! And the twine bow is a perfect touch!! Gorgeous card my friend!! It will bring a huge smile to the recipient's face!! This is way too cute! This would make ANYONE feel better! What a adorable card!! Love that sweet bear and pretty bow!! Love it!! Have a great day. Gorgeous card!! 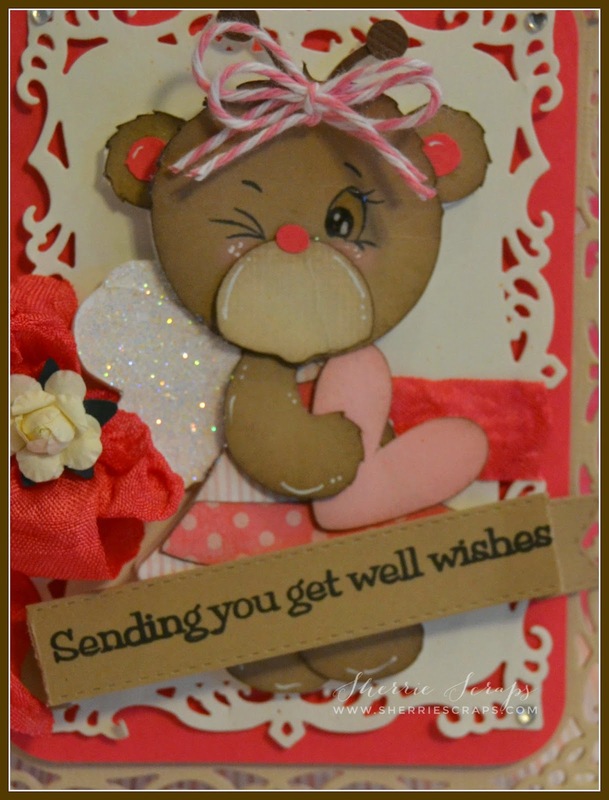 !Love the shape of card and sweet little bear!! !The wings look so beautiful with that glitter!!! 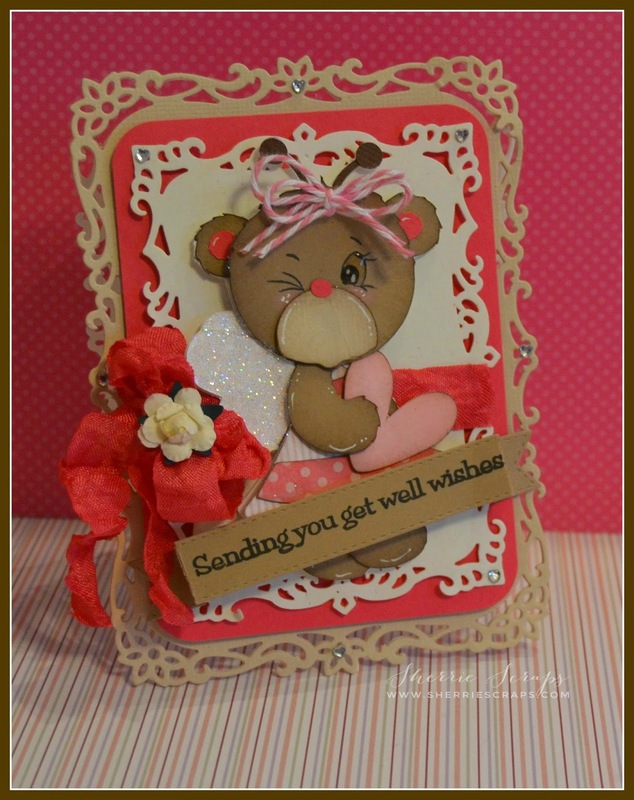 Super cute, love the card base and the bear is simply adorable! Soooooooooo cute cute cute! LOVING that bear and how you added twine to her head!!!!!!! Fabulous card Sherrie! So stinkin' cute! Love the wink! Oh she is a cute little bear! I really love those dies you used they are so pretty! So very cute Sherrie! Love how you gave the sweet bear rosy cheeks! Oh this is adorable Sherrie!! I love her cute face so much and love the colors and elegant frame. Thanks for playing along with us this week in our Funday Friday challenge at Jo's Scrap Shack! Enjoy your week! This card is so darling! I love all of the delicate die cuts you used. Thank you for joining the DoubleClick Skittles Animal Challenge! Our new "Use Green" Challenge starts today. We hope you will join us again soon! What a cutie you have here. Love the face, the colors and her glittery wings. This card would for sure make someone feel better. Oh my gosh - what a cutie! 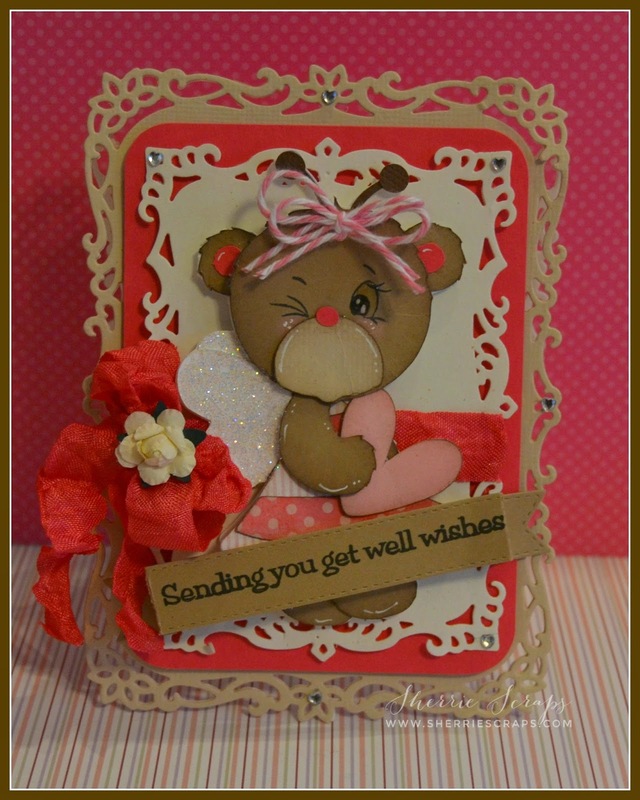 I just love the peachy face you used for this darling little angel bear. Your card layout is also just amazing - loving all those fabulous layers! Such a fun card! Love that sweet bear with the most adorable face! Your card base is fabulous, love each of the gorgeous layers! The twine looks awesome too! Sherrie, your bear is simply ADORABLE. Oh and the card base is beautiful too ! Super cute. TFS and joining us at Jo's for Funday Friday. This is sooo , soo cute !!!!!!!! The little bear is wonderful and bursting with cuteness !!!! Sounds like you had a wonderful weekend !!!!!! How fun !!!! Oh my friend, this is just the type of card that makes me think of you and your signature style! The dies, that sweet little bear and the fabulous bow! Oh your weekend sounds wonderful. I wish I had some buddies to craft with :( That sounds like so much FUN. I see you've been spending some time with that new baby...oh she's so sweet! Very pretty :) Thank you for joining us in our Funday Friday challenge this week. What a beautiful card!! I'm in love with the base you created. WOW! And that little bear is precious! What a wonderful way to brighten the day of somebody feeling under the weather!